← Come Enjoy Authentic Smoked Meats at Rackz BBQ! Buffets are one of the easiest and most affordable options for catering a large event or party. A self-serve style lunch and dinner plan is an excellent option for big crowds since it allows everyone to customize their own meals, gauge their own appetites, select their own portions, and best of all, clean up after themselves! Continue reading to learn more reasons why buffets are an excellent catering plan for your upcoming gathering or event, including a fantastic meal option that suits all occasions. When you have several mouths to feed, but a limited amount of time and/or money to make it happen, a buffet is the way to go. Not only does a buffet plan help you in terms of schedule and budget, it works well to please everyone by providing options. It can also reduce costs since you needn’t hire professional waiters and cleanup crews. There are many advantages to buffet-style catering, but it is important to remember a few tricks of the trade for a flawless operation. When a buffet is not set up properly, the movement of buffet-goers can become quite unruly. The line can get backed up, packs can gather, and spaces can get invaded, all of which can disrupt the flow and turn the buffet into a disorderly process. 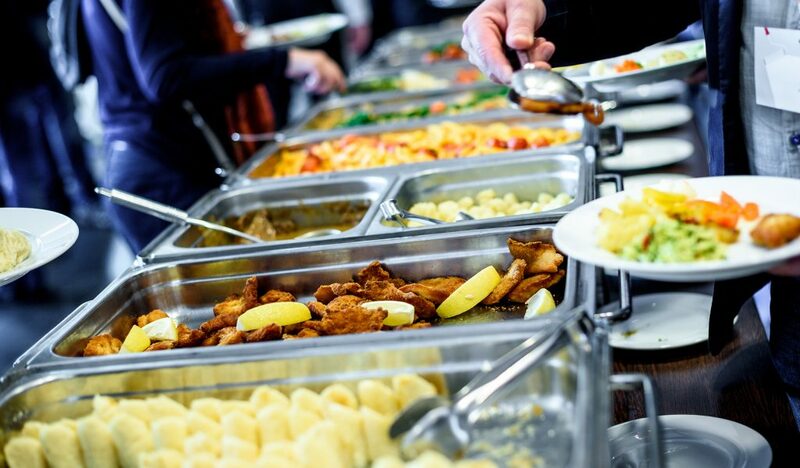 To combat poor buffet flow, set up your line in a way to direct the movement of your crowd. There should be a start, middle, and end. For instance, plates should be at the front, followed by inexpensive appetizers and snacks, main cuisines in the middle, and then utensils and napkins at the end. If you notice, drinks are not mentioned because it is better to have a drink station that is separate from your main buffet. This also helps to manage and control crowd flow. Drink stations and dessert stations should be at separate tables, moderately far from the main buffet, in order to help improve fluidity of movement, as well as, provide more breathing room for guests to enjoy their treats. Also, having a drink station makes it easier for guests to grab refills. Another tip for crowd flow management is to set up a predesignated dining area that is away from the buffet line. This gives guests a destination to end up at after serving themselves at the buffet and helps to prevent dawdlers. You may want to even consider putting utensils and napkins on tables in the dining area to better direct guests after the buffet. It is the small things that matter when serving yourself at a buffet line. Things like salt and pepper shakers, condiments, sugar packets, coffee stirrers, and more make dining that much more convenient and enjoyable for your guests. Don’t forget these small items for their sake! At the same time, you want to make sure everything is in abundance. Guests hardly reuse plates and glassware for refills or second helpings. So put out extra stacks of everything from plates and glasses, to saucers, napkins, utensils, and more. A helpful hint: place napkins with their folded edges facing forward to make them easier to grab! When hosting a buffet-style event, a huge bonus is that guests throw away their own trash. But if there are no trash cans available, it nullifies this bonus entirely. For this reason, it is imperative to have an abundant amount of trash receptacles available for guests to dispose of their garbage. Place two by the buffet line, and a few around the venue to ensure ease of accessibility for guests. Choose Rackz BBQ if you are looking for a fun and delicious meal idea to serve to your guests! We provide custom BBQ catering services at an affordable price here in Indianapolis and its surrounding areas. Choose from a wide range of custom, homemade catering options, from smoked meats and homemade appetizers, to made-from-scratch side dishes, pies, and more! Contact us at 317-688-7290 to place a call ahead order, or to learn more about our catering selections and prices, anytime. 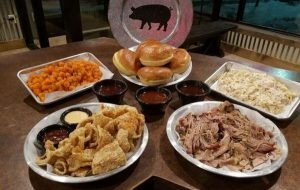 This entry was posted in Barbecue, Catering and tagged barbecue catering carmel IN, buffet style catering, Catering buffet tips, Indianapolis BBQ Catering, party buffet tips, small party catering carmel in. Bookmark the permalink.